Enlighten your seder with one or two of these ancient and modern Passover customs practiced around the world. Use translations from our book and connect them with activities that are fresh and new for your family, appreciating Jewish traditions within the context of our modern world. During the recitation of each plague, Moroccan Jews spill wine from red and white wine pitchers into a bowl. Each child in Belarussian families said the Four Questions, doing them in reverse age order: the oldest asks the question(s) first, then the next youngest, on down the line until the youngest. I think this is a magnificent way to ease the anxiety of the youngest child, who may be reciting the questions for the first time. Instead, the youngest become comfortable and familiar with them, hearing them recited by his or her older siblings first. At seders in Barcelona and Morocco, everyone recites "In haste we left Egypt" three times. Then leader walks around the table three times tapping the seder plate on the head of each participant, each time tapping harder. 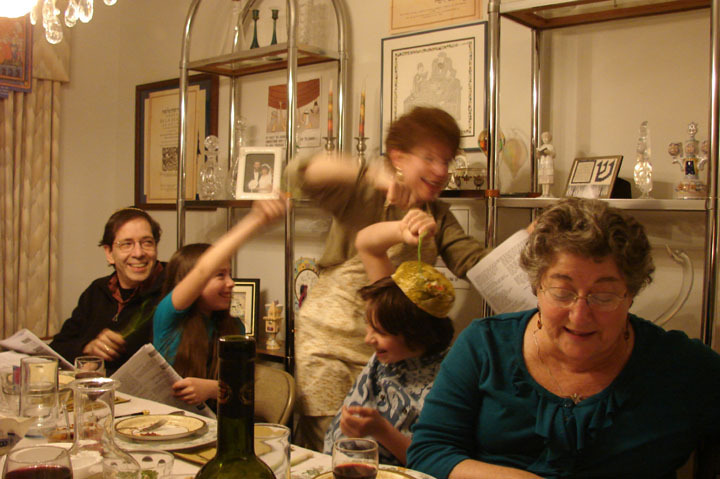 The children like to jump up in order to hit the seder plate with their heads. 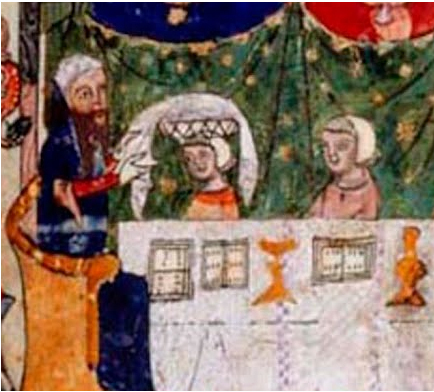 The illustration on right is from the 14th C Barcelona Haggadah, shows people tapping the seder plate on their own heads. The custom is a reminder of the hardship and oppression of slavery. 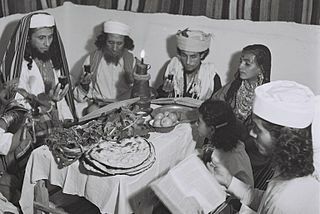 Another custom from the Jews of Morocco: They pass the seder plate over their heads while singing "We were once slaves, now we are free." (They sing it in Hebrew and Arabic.) Once that is done, the leader again passes the plate, this time over the center of the table. This is to honor those no longer with us, a beautiful way to remember them. In Southern Germany, the seder leader would put the matzah wrapped in the white matzah cover on his shoulder and say: So sind die Kinder Jisroel aus Mizraim gegangen, so war es. ("Thus did the Children of Israel leave Egypt, so it was"). Many Moroccan Jews skip the plagues! It is their belief that the plagues bring the "evil eye," which is associated with bad luck. They do refer to the plagues, but do not recite each one individually. The youngest child holds the egg while a special text, which follows the Four Questions, is read ("A Night Among All Nights", page 338 and on DVD). The paragraph recalls the work of making bricks from straw, and lists the plagues while cursing Pharaoh. Hungarian Jews decorated their seder tables with gold and silver jewelry to remember the precious metals the Egyptians gave the Israelites, hoping that the plagues would stop. An appropriate time to explain this would be during the recitation of the plagues. One clever suggestion is before the 10th plague, have some of your participants pretend to be Egyptians, using the jewelry to beg the Israelites to end the plagues. The Greek Jews from Ioannina call the seder Hova, which means obligation. These Romaniote Jews start the seder with everyone placing their hands on the table and reciting in Hebrew "This is the table before God" or "This is the table that is set in front of the Lord." The Jews from Cochin, India, place two special cups of wine on the table, Elijah's cup and Pharaoh's Cup, with Pharaoh's Cup being near the seder leader. Instead of everyone taking wine drops out of their cups during the listing of the plagues, only the leader does so using the special Pharaoh's Cup. After all the plagues are called out, the leader washes his hands. The Italian Anusim (Italians whose ancestors were forced to convert to Christianity, eg conversos) add a red beet to their seder plate. This bietola symbolizes the lamb's blood that the Israelites put on their doorposts. At Ha Lachma, seder leaders in Persia (modern-day Iran) took the three matzot wrapped in a white cloth and chanted Ha Lachma and Kadesh Ur'chatz (the Order of the Seder). Then as the matzot were passed from hand to hand, each person, young and old, men and women, recited Ha Lachma and Kadesh Ur'chatz until everyone was done. 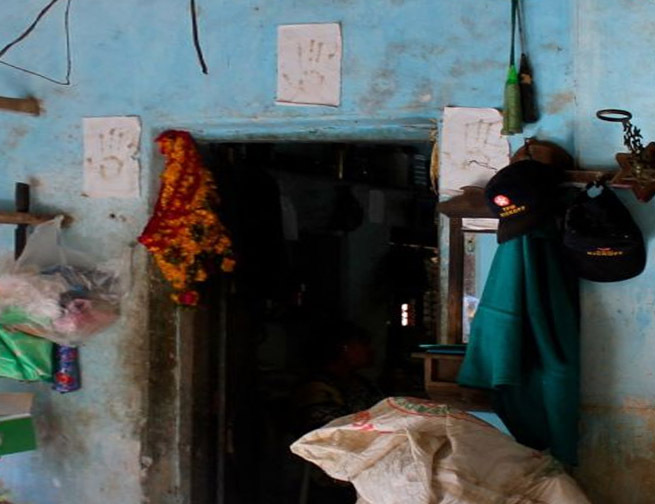 The children of the Bene Israel Jews around Mumbai place their hand prints on pieces of paper, which are then taped on the top, right, and left of the entrance. (In villages, the hand prints are left there all year round.) Traditionally, the hand prints are made with goat's blood, to remind them of the Biblical verses: "And the blood will a sign for you on the houses where you are; and when I see the blood, I will pass over you." We recommend using red food coloring as a stand in for goat's blood! The seder leader pretends to be one of the Israelites. Using a wood cane, he would walk around the table, telling everyone about his life as a slave and the miracles he witnessed. After reading Haggadah in Morroco, all the men put a stick with a bundle on their shoulders and they leave the house in haste, running and shouting: "So did our ancestors leave Egypt, their kneading bowls wrapped in their cloaks upon their shoulders"
During the recitation of the 10 plagues, the Bene Israel of India pour wine from a goblet to another "vessel" (could be similar to our modern usage of a saucer), then immediately wash their hands and the goblet, then refill it with wine. Grab a few scallions, tear them in two by hand and throw them over your shoulders. This symbolizes breaking the backs of your enemies and getting rid of them. One member of Yemenite families takes a matzah and ties it in a scarf on his shoulder and walks around the house. The others ask him: "Why are you doing this?" And he replies: "So did our ancestors when they left Egypt in haste." At the seders of the Persians (Iran) as well as Iraqis: The youngest child takes the matzah, places it in a bag on their shoulder, and walks around the seder table. All the guests get up and follows the child, who is playing Moses the leader taking Israelites out of Egypt. The redemption was said to come on Pesach eve, so Yemenite Jews left their doors open during the entire seder in order to allow a swift exit to greet the Messiah. After Karpas in Germany's seders, everyone would leave the table with the matzot wrapped in coverings, placed on their shoulders; they'd walk to the corners of the house, and then return to their places. 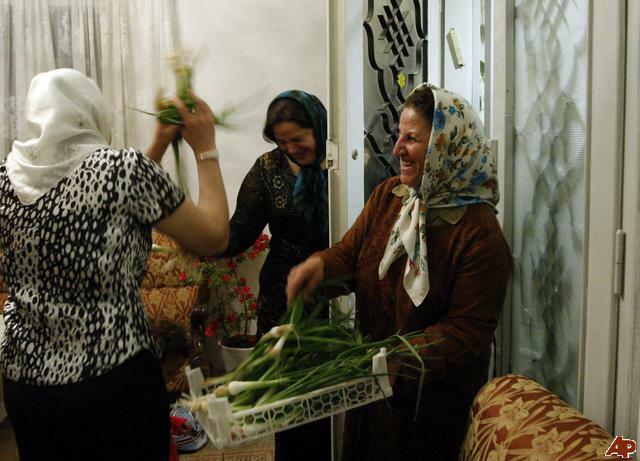 Libyan Jews were afraid non-Jewish neighbors would inundate them for unlimited free food. So they translated the Whoever is hungry section as "Whoever is hungry, let him come and taste nothing!" The Jews of Yemen put all the seder symbols directly on the table – no seder plate for them! When the door was opened at seders in Germany, someone in costume entered the room quickly, to mimic Elijah arriving to announce the coming of the Messiah. As each plague is recited, Greek families pour vinegar into a basin beside them. Instead of using a seder plate, the Jews from Tunisia put all the seder symbols in a reed basket on their table. Before reciting Ha Lachma, the hostess circles the basket over the head of each seder participant while saying "We quickly left Egypt." The participants answer with "Yesterday we were slaves. Today we are free. This year we are here. Next year we will be free people in the land of Israel." Some believe the basket represents baby Moses, and hostess carrying it reminds us of his mother Yocheved and sister Miriam. Jews in 17th C Poland believed the Afikoman had magical protective powers. The leader of the seder broke off a small piece from the Afikoman, pierced it and hung the small piece on the wall. Modern families have told us they would carve a portion into a tiny round matzah, and hang it on the wall for months for good luck. Combine with the observance/memorial of Warsaw Ghetto uprising, which started on the eve of Passover. 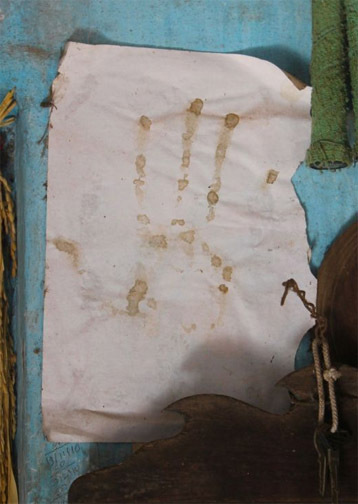 Moroccan Jews dip a hand in charoset, impress it on a sheet of paper, then hang it above the doorway as a hamsa, the symbolic, protective hand of God. (The Bene Israel Jews in the villages around Bombay do the same thing using sheep's blood!) After the seders, the Moroccans strip the shankbone of meat, leaving it in the cupboard all year as a good luck omen. Iraqi-Indian Jews stash a bit of the Afikoman away the rest of the year as a good luck omen. They've been known to take it on plane rides to make sure they arrive in safety. At the end of the seders in Turkey, the father or grandfather throws grass, coins and candy for the children to collect, symbolic of the wealth the Israelites brought out of Egypt (the grass represents the reeds of the Red Sea), and a wish that the year ahead should be "green" and productive. Just before the recitation of the plagues, a separate tablecloth was put out in Iraqi homes. When the drops of wine, representing the plagues, were placed on the plates, the extra tablecloth figuratively protected the people at the seder from the plagues – it kept the plagues on the plate, so to speak. The number four is used a lot during the seder: 4 sons, 4 cups of wine, 4 questions ... But only at the seders of the Bene Israel of India, there is a symbolic four used nowhere else: 4 times wash the hands. It is customary worldwide to wash the hands 1) after Kiddush (without a blessing) and 2) before the meal (with a blessing). 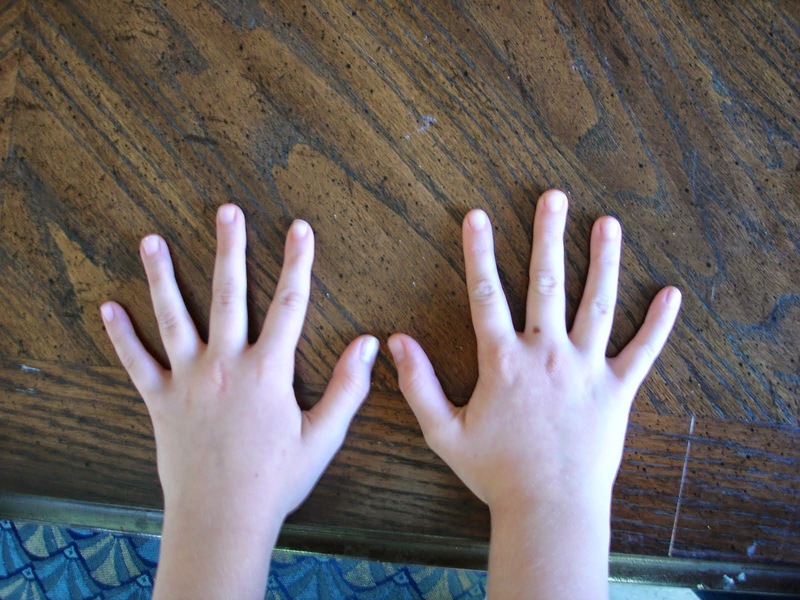 In some countries, especially among Chassidim, the hands are briefly wetted with a few drops 3) before Grace is recited. But only the Bene Israel of India also wash their hands 4) after the 10 plagues. The recitation the plagues is done only by the leader, so that the others will not be contaminated. In the custom of many Arabic and Balkan Jews (especially Turkey), the leader pours wine into a bowl, but everyone else doesn't even look as the wine is spilled out.